Menopause is in full flow, you're suffering from many of the signs and symptoms, but sometimes you're unsure how to recognize or treat them. While the most well-known symptoms of menopause are hot flashes, mood swings, and vaginal dryness, there are many other symptoms, such as bloating. This can be uncomfortable, especially if experienced frequently. Bloating is a tight feeling in the abdominal area and a feeling of fullness that leads to discomfort or pain. Generally, it's caused by extra gas in the intestines or water retention. Bloating during menopause is not different than during any other time, but menopausal women are more susceptible to bloating because of hormonal imbalance. Bloating varies greatly in severity and frequency. 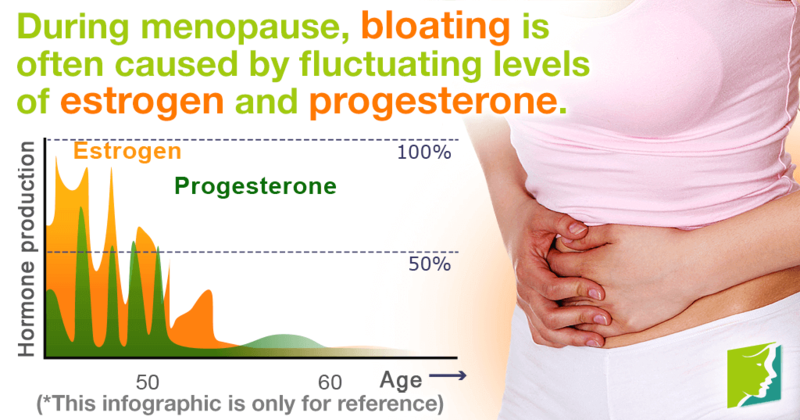 During menopause, bloating is often caused by fluctuating levels of estrogen and progesterone. However, there are other potential causes, such as a food intolerance, swallowing too much air (possibly from chewing gum or drinking with a straw), poor nutrition, too much salt, dehydration, irritable bowel syndrome, and some medications. These are just some of the many habits and conditions that can lead to bloating. Often, a person may experience fatigue and have trouble breathing as a result of severe bloating. If bloating is accompanied by other symptoms such as vomiting, chest pain, constipation, diarrhea, or bloody stools, it may indicate a more serious problem, and you should contact a doctor immediately. How Can I Manage Bloating? Bloating can be easily managed and even prevented with certain lifestyle adjustments. Everybody reacts differently to different foods, experiences, and exercises. Keep a diary of what you were doing, eating, and drinking and see what aligns with bloating episodes. This will help you discover some of the causes. Eating too quickly, chewing gum, and drinking carbonated drinks can disrupt the digestive system. Alcohol, junk food, and artificial sweeteners should also be avoided because they are notorious for causing bloating. Some foods can cause bloating, like processed and salty foods, cabbage, cauliflower, onions, broccoli, sprouts, and beans. Eating fiber can help relieve constipation related to bloating, but too much fiber can actually worsen it, so be careful. It is recommended that women consume 25 grams of fiber daily and 21 grams when they are older than 50. A workout regimen of at least 30 minutes of mild exercise a day can greatly improve your physical, mental, and gastrointestinal health. Walking after lunch may help facilitate smooth digestion. Stress and anxiety can lead to many psychosomatic problems, including bloating. Balancing stress levels can also relieve physical symptoms. By understanding this common menopausal problem, you can help ensure that it doesn't become an embarrassing issue in your life. Click on the following link for more information about treating bloating during menopause. This article outlines some of the less obvious factors that can lead to bloating and nausea. Check out this article for quick tips on how to eliminate the uncomfortable feelings of bloating that so often accompany menopause. Many menopausal women experience bloating. This article gives information about bloating as a menopausal symptom and looks at its signs and symptoms.